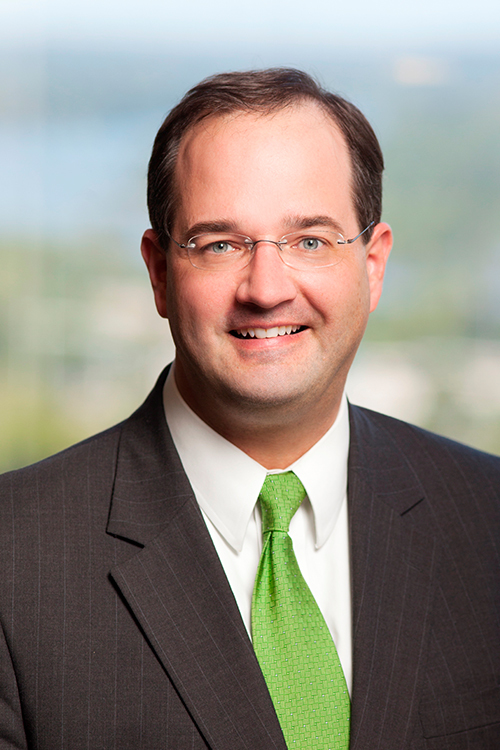 John Keeling Baker has over 20 years of experience in successfully trying and appealing a variety of business tort, contract, real estate, taxation, and class action suits before state and federal trial courts, Arkansas appellate courts, and the Eighth Circuit Court of Appeals in St. Louis, Missouri. Secured trial court judgment on behalf of regional hospital successfully exempting seven real estate parcels from ad valorem taxation following trial in North Arkansas Regional Medical Center et al. v. Hardesty, Boone County Circuit; Case No. 05CV-17-275. Successfully defeated attempted intervention by class member objecting to approved class settlement in Wartick v. USAA, 2017 Ark. App. 329 (2017). Served as federal court-appointed liaison counsel for European litigants in federal court multidistrict litigation in In Re Genetically Modified Rice Litigation, MDL 1811 (E.D. Mo.). Successfully defeated attacks on general election ballot access for Saline County, Arkansas voters on alcohol sale issue in Our Community, Our Dollars v. Bullock, 2014 Ark. 457 (Ark. 2014). Successfully secured dismissal of class allegations in nationwide consumer electronic goods class complaint against client in Jarrett v. Sanyo Mfg. Corp., 4:12-CV-00739-SWW (E.D. Ark.). Successfully secured six figure monetary judgments for client against former employees sued for breach of fiduciary duty and embezzlement in Helena Chemical Company v. Skinner et al., 4:11-cv-00691-BRW (E.D. Ark.). Successfully defeated attacks upon trial court’s approval of nationwide class settlement of 250,000 insureds Hunter v. Runyan, 2011 Ark. 43 (2011). Successfully secured reversal of federal court’s denial of remand of state court action in Usery v. Anadarko Petroleum Corp., 606 F.3d 1017 (8th Cir. 2010). Successfully obtained dismissal by summary judgment of Franchise Practices Act claim and three remaining causes of action brought against client by former agent in Gunn v. Farmers Insurance Exchange, 2010 Ark. 434 (Ark. 2010). Successfully defeated motion to certify class action sought by municipal bondholders against client in Mittry v. BancorpSouth Bank, 360 Ark. 249 (2005). Successfully obtained dismissal by summary judgment of three distinct causes of action brought against client by customer in Slusser v. Monsanto Company, Inc., 198 S.W.3d 106 (Ark. 2004). Successfully obtained summary judgment on declaratory judgment relief and dismissal of specific performance of contract counterclaim in Dev. & Constr. Mgmt. v. City of N. Little Rock, 119 S.W.3d 77 (Ark. Ct. App. 2003). Served as state court-appointed Special Circuit Court Judge for Arkansas’ Sixth Judicial District (Pulaski and Perry Counties). Successfully obtained a precedent-setting federal court injunction for client against U.S. Secretary of Health and Human Services in Pathfinder v. Thompson, 177 F. Supp. 2d 895 (E.D. Ark. 2001). Successfully tried breach of contract action and defeated appellate attacks on six figure judgment obtained for client in First Fin. Bank v. Mazzio’s Corp., 2001 WL 219389 (8th Cir. 2001). Successfully defeated motion to certify class action sought by home buyers against client in Winkler v. Superior Financial Corp., 4:01-CV-00851-SWW (E.D. Ark.). Successfully obtained a favorable first impression ruling for client under Arkansas Freedom of Information Act in Kristen Inv. Props., LLC v. Faulkner County Waterworks, 32 S.W.3d 60 (Ark. Ct. App. 2000). Successfully obtained dismissal by summary judgment of Americans with Disabilities Act claim brought against client in Land v. Baptist Med. Ctr.,164 F.3d 423 (8th Cir. 1999). Member, Past President, Quapaw Quarter Association, Inc. Co-Founder, Past President and Member, Tree Streets, Inc. Member, Board Member and Treasurer, Arkansas Urban Forestry Council, Inc.
Past President and Board Member, Camp Aldersgate, Inc.
Past Secretary and Board Member, Camp Aldersgate Foundation, Inc. Co-Founder and Board Member, Great Southern Stone Skipping Championships, Inc. Member, Past Board Member and Past Secretary/Treasurer, St. Thomas More Society of Arkansas, Inc.
What is Arkansas' Pre-Judgment Interest Rate? A Vexing Question with No Clear Answer.